Santa Gertrudis are considered to be America's first beef breed. They were developed on King Ranch to function in hot, humid, and unfavorable environments. 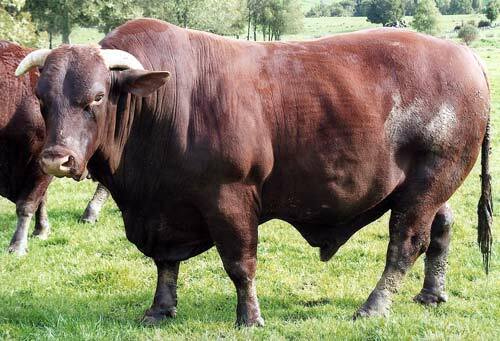 They were developed by crossing Indian Brahman cattle with British Shorthorns. In 1920, years of experimentation culminated with the birth of Monkey, a deep red bull calf. Monkey became the foundation sire for not just a superior line of cattle, but an entirely new breed. In 1940, Santa Gertrudis was recognized by the U.S.
Santa Gertrudis cattle are approximately five-eighths Shorthorn and three-eighths Brahman. They are a deep cherry-red color with a relatively high degree of both heat and tick resistance. Santa Gertrudis females are known for their exceptional maternal traits. Their characteristics include ease of calving, good mothering ability and abundant milk supply.